I consider prayer as one of the greatest gifts that we can give and receive. I appreciate any prayers I can get from friends, family, even from others who I don't know that well. It is so comforting to know, that when I am struggling, others are taking the time to pray for me. That is why I feel so strongly about praying for others. Sometimes the best thing that you can do for others is pray for them. Especially when they may be struggling and there is nothing else that you can do for them. I feel that I am pretty good at praying for others when they come to me and ask. I usually pray right then and there with them or to myself after we finish our conversation. Otherwise, things come up, my day goes on, and I'm left disappointed because I told them I would pray and then forgot to. It's called prayer on the spot. It's a great practice that I am glad I got into. I do however, have trouble praying for everyone each day. I have a lot of family and friends and if I am being honest, I don't pray for them like I should on a daily basis. I want to change this though! I created a monthly prayer calendar, so that everyday I can pray for someone different. I know that this only ends up being once a month, but for now that's ok. I would rather pray for my family and friends consistently every month, then forget to do it at all, everyday! I will still continue to pray for others when they come to me with requests, but this calendar is for ongoing prayers such as health, safety, blessings, and so on. 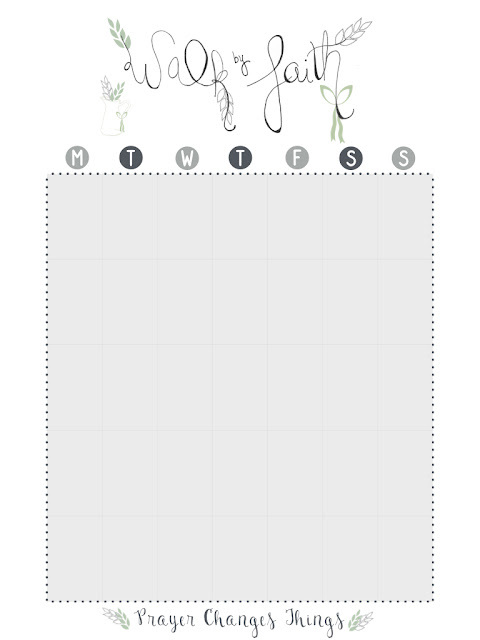 Feel free to download this --> calendar (click on the word) for yourself and fill it in with your family and friends. This is the greatest gift that you can give them, even if they don't know that you are doing it!